Gembird Europe BV, based in the Netherlands manufacturer of computer products, has recently released the world’s most efficient LED bulb: http://igg.me/at/energenie-lamp/x/4902764. The EnerGenie LED bulb features 135 lumens per watt, the longest ever lifetime, light angle of 330 degrees and a high Color Rendering Index of 85. The unprecedented performance is due to a patent-pending heat pipe design. The heat pipe is quite commonly used for the cooling of computer CPUs but has never been seen in the LED bulbs before. Optimal cooling and 3D placement of the LEDs lead to about 40% extra efficiency and much longer lifetime against traditional LED bulbs. The EnerGenie LED bulb is available in 3 models – 8W, 10W and 12W, the latest being seen as a true replacement of 100W incandescent (producing 1600 lumens). The EnerGenie LED bulb is a mature product, ready for mass production and the first shipments will be made in March 2014. Gembird Europe BV has published their product at a crowd-funding site Indiegogo not to raise funds but to get a feedback from the market. Contributions are seen as voting for the product to become available in the corresponding country. Contributors are actually invited to place the pre-orders with up to 60% discount from the expected retail prices. The Indiegogo campaign will expire on November 22, 2013. 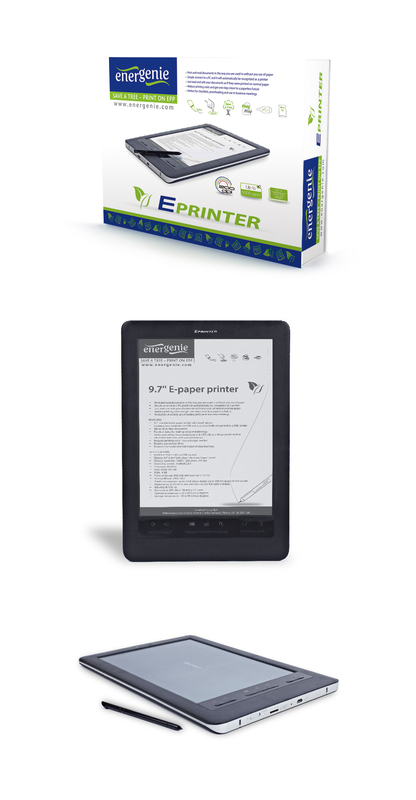 The innovative EnerGenie e-paper printer (EPP) enables users to print and read documents in the way they are used to, but without any use of paper. Just simply connect the EPP to a PC and it is automatically recognized as a USB-printer. The e-paper printer stores all printed documents and allows reading and editing them as if they were printed on normal paper. The e-paper printer reduces printing costs and is one step closer to a paperless office. More information can be found on the Energenie website.